Sisi’s efforts to broker the reunification of the Libyan army are less about stabilizing its neighbor than empowering Khalifa Haftar against shared Islamist foes. Rather than making North Africa safer, securitizing borders has raised the risk of instability along the region’s frontiers, where communities depend on smuggling. To maintain his reputation as Libya’s only savior, Haftar is now more likely to make dramatic moves against declared enemies and inside his own camp. The presence of foreign armed groups in Libya’s south poses an increasing threat to local security and regional political ties. Although Maghreb states have tended to pursue border security unilaterally, increased transnational coordination at the local level offers a more sustainable approach. Ghassan Salamé’s action plan for Libya faces numerous obstacles from entrenched political elites, who see it as just another venue in which to seek personal gain. A Constitutional Panacea for Libya? Without an accompanying roadmap and buy-in from the population, a referendum on Libya’s draft constitution risks leaving Libya’s crisis of legitimacy unresolved. To address the Mediterranean migrant crisis, the EU is seeking closer partnerships with North African states. 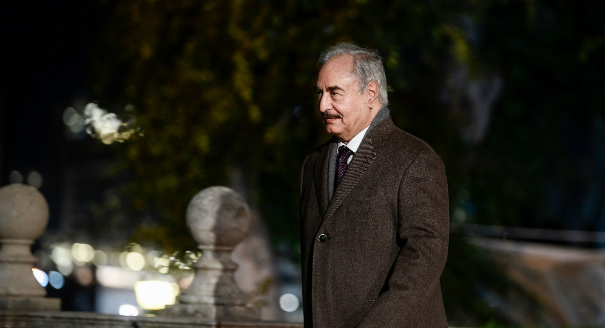 Russia’s support for Khalifa Haftar in the name of countering terrorism could instead escalate Libya’s conflict and undermine the UN-sponsored political process. Sada contributors share their take on what the extraordinary election of Donald Trump could mean for a region in turmoil. Libyans and their international partners can unite against the Islamic State, but external political and military engineering is undermining the prerequisite nation building. Despite apparent progress toward a power-sharing agreement, Libya’s governing bodies still face problems of neutrality and representation that will hamper their ability to govern effectively. Local and international interest in the trials of Qaddafi-era figures has waned amid ongoing issues regarding transparency, access, and legal representation.